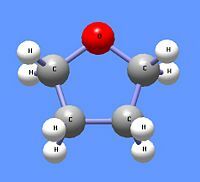 An ether is a chemical compound in which two hydrocarbons are joined together by an intervening oxygen atom. Ethers, particularly diethyl ether, often called simply ether, and tetrahydrofuran (THF) are common solvents for organic chemistry reactions. 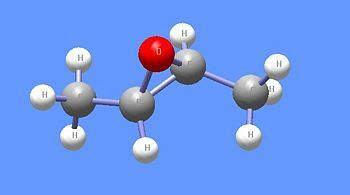 Diethyl ether was one of the first anaesthetic agents. Many ethers are extremely flammable, and thus use of diethyl ether in the operating room, in the presence of high oxygen levels, in no longer used. The Williamson synthesis of ethers uses the nucleophilic nature of alkoxide ions to react with primary alkyl halides using an SN2 reaction mechanism. Thus, the reaction of sodium isoproproxide reacts with n-butyl iodide to produce the asymmetric ether n-butyl isopropyl ether. Primary alkyl halides are used to minimize the E2 reaction mechanism. In a method analoguos to the hydration of alkenes, ethers can be formed by reacting alkenes with an alcohol and an acid catalyst, or with an alcohol and mecury acetate. The Williamson synthesis, but not alkene-based methodes, can also be used to from cyclic ethers like tetrahydrofuran. To produce cyclic ethers, a primary alkane is used that contains a halide atom at one end and an alcohol on the other end to undergo an intramolecular reaction. The addtion of the strong base sodium hydroxide (NaOH) creates an alkoxide ion from the alcohol. The alkoxide end reacts with the halogenated carbon in an SN2 mechanism, cyclizing the compound while eliminating the halogen atom. Thus, 4-chloro-1-butanol, in the presence of sodium hydroxide, produces tetrahydrofuran. Oxiranes, also called epoxides are class of cyclic ethers with only two carbon atoms and one oxygen atom in the ring structure. In addition to the Wiliamson ether synthesis (in which case the starting material, which has neighbouring hydroxyl and halide groups, is called a halohydrin), oxiranes may be formed by reacting an alkene with a peroxyacid, a carboxylic acid with the OH group replaced by an OOH group. The most common of these is meta-chloroperbenzioc acid (mCPBA). Ethers are readily cleaved with the addition of heat and a strong acid such as hydrogen iodide (HI). HI is often used because it is acidic enough to protonate the oxygen atom of an ether and the iodide ion is nucleophilic enough to attack the alkyl group of the protonated ether. Thus, anisole (methyl phenyl ether) can be cleavage to produce phenol and methyl iodide in the presence of HI and heat. Because oxiranes are less stable than other cyclic ethers due to ring strain, hydrogen bromide (HBr) can be used, without additional heat, to cleave oxiranes such as trans-2,3-dimethyl oxirane. The acid-catalyzed ring-opening of the oxirane enantiomer shown here produces (2S,3R)-3-bromo-2-butanol. Oxirane rings can also be broken by the nucleophilic attack of either of the oxirane carbon atoms. Common nucleophiles such as alkoxides and amines can open oxiranes and build up a chemical structure. This page was last modified 22:14, 31 October 2010.